The leading role of morning market is farmer’s direct sales adopted vegetables, fruits and legumes! How about walking in the morning? *Items : Farmaer’s direct sales of vegetables, beens, flower, wild vegetables, and so on. Fire New Year ‘s festival that collects decorations of the New Year and others. Children are centering and implemented. Bring a brow brown to a blazing fire, bake and eat. 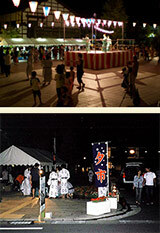 The festival of the first Koshin will be held at Asama Spa Onsen Koshindo. Dharma and luncheon shops and open-air stores will open. Resurrected as Spring Festival at Asamaonsen Spa. Departing from Misa Shrine, children rush through the boat and walk through the hot spring town, prosperous in business, prosperous domestic prosperity. A long time ago, sericulture to make silkworms seeds was more active than Asama hot springs, and at that time children also took a ship and prayed for healthy growth and development. For that reason the silkworm cocoon is on board the boat. In the land of Asama Spa where “Tenkan (crown)” excavated from the Sakuragaoka ancient tombs from the 5th century, remembering the hearts of “Toraijin” who came all the way beyond the sea from Northeast Asia, deepening understanding and friendship, and thinking about the way of living together. Asama Spa Firefly Festival executive committee has been raising hard for a year from river cleaning to caring for firefly larvae, caring for Kawanina which will serve as food. Asamai Onsen Firefly Festival is scheduled to be held from 30th June (Monday) to 6th July (Sun) in 2017. After dinner for the last 4 or 5 days before the lantern festival, the elementary school boy walks inside and outside the district while saying “Aoyama-sama Dai Washoi Korasho …” with a shrine marked with a cedar leaf and written as Aoyama Shrine. , A child’s event from ancestral faith. At the same time with Aoyama-sama, elementary school girls from infants simultaneously wear clogs with long sleeves kimonos, put a paper ribbon on their hair, hold a lucid lantern, sing “Bonbon totemo kyou asu bakari …” That is a poetry in the summer night. In addition to Bon-Odori which is familiar to everyone, such as traditional dancing “Asama Bushi”, “Matsumoto Bonbon”, “Tankou-bushi”, etc., “Shinshu Sobari Soundhead” will also be shown. Even if you do not know the dance, anyone can dance together with the guidance of a teacher of local “Sho no kai”. Shops, mini concerts, etc. are held. Enjoy summer lantern festival at Asama Spa. Held to aim for becoming a base for creation and culture. A writer who has unique creative activities in Matsumoto and its surroundings, or a musician who continues to do steady activities, gathered many people to know the local culture. This Creative Culture Festival is getting more fun by participating in writers who are doing unique creative activities from all over the country (far away from Kyoto · Okayama) and exchanging creative culture. Using the fresh soba noodle flour, the local self-proclaimed “soba noodle master” offers buckwheat noodles. There are also products with soba and hot spring bathing set.